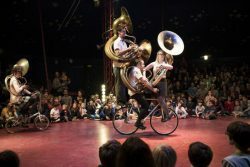 AS part of the Circus250, the nationwide celebrations of the anniversary of modern circus, French company Circa Tsuica comes to Hamworthy Park in Poole from Friday 6th to Sunday 8th July with its latest show, Now or Never. The performances will be accompanied by the jazz orchestra from Queen Elizabeth’s School. On Monday 2nd July, 11 acrobat-musicians from the French contemporary circus company will arrive at Hamworthy Park to start the preparations. Now or Never is a collaboration with seven young musicians from the Wimborne school. 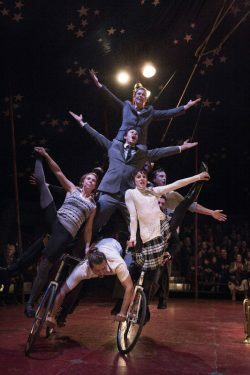 Potential audiences can watch as the company erects the red-and- white big top in the park and then sets up its circus village – recapturing circus traditions for the 21st century. When the tent opens to the public on Friday 6th July, the audience can expect an exhilarating fusion of stunning acrobatics and funky brass rhythms, in which acrobats, musicians and audiences all play their part. 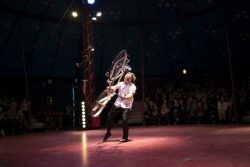 The performers will mingle with the crowd, making and sharing Breton crêpes, before launching into a feast of music and circus. 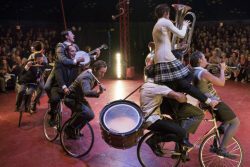 The acrobat-musicians fly, fling and swing across the tent on trapezes, tightropes, Cyr wheels, trick bicycles, trampolines and seesaws, all the while playing their thundering brass rhythms accompanied by the young musicians from Queen Elizabeth’s. Baptiste Bouquin from Circa Tsuica has been teaching the musicians their roles in the show at two workshops during June. Steve Glover, leader of the jazz orchestra at QE, says his students are very excited and can’t wait to perform in the big top. Performances start at 7pm on Fri­day and Saturday 6th and 7th July and at 5pm on Sunday 8th. Posted in Circus, Ragazzata on 28 June, 2018 .